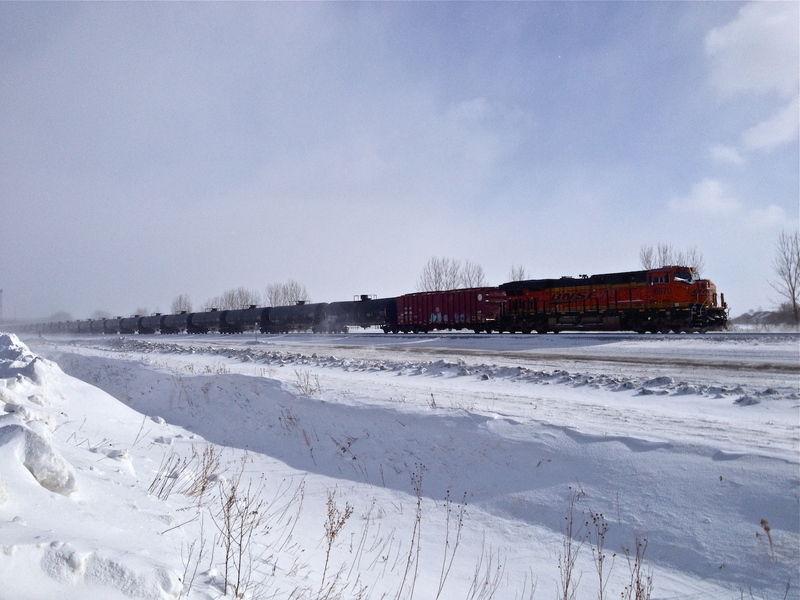 A photo from a couple weeks ago of a BNSF train facing west with Bakken oil cars in tow. This was taken just east of Moorhead, Minnesota. If the train cars are going east, they are carrying oil. If they are going west, they are returning to pick more oil up. This entry was posted on Monday, February 10th, 2014 at 5:31 pm	and tagged with Bakken, Man Camps, North Dakota, Petroleum, Trains and posted in Uncategorized. You can follow any responses to this entry through the RSS 2.0 feed. Generally, this is an apt rule of thumb. With service disruptions (weather, derailments, etc. ), this may not always apply. Look at the coil springs underneath the tank cars. If they are compressed, they are loaded. If they aren’t, they are empty. This method can also be used to determine if any railroad car is loaded or empty. Cheers!